We are pleased to announce that a number of our lawyers will be partaking in upcoming environment and planning law events. Glen McLeod, Principal of Glen McLeod Legal, will be chairing a presentation which will focus on the emergence of the power associated with community interests as part of the development assessment process. The legislative starting point is a system where there are no third party appeal rights in Western Australia. Despite lack of rights vested in the community, in respect of planning decisions, the emergence of communities’ influence has been seen in recent years with several successful judicial review applications in the Supreme Court. Planning authorities, particularly joint development assessment panels, are now inundated with deputations from community representatives, particularly, large projects, sometimes controversial, where significant exercise of discretion is required in order for an approval to be obtained. This momentum is starting to gain traction with decision makers and also those that are charged with the responsibility of planning reform. The premise of the paper and associated discussion will be as with Gulliver’s Travels, the need to deal with the rising giant, lest the possible destruction of meritorious planning proposals. 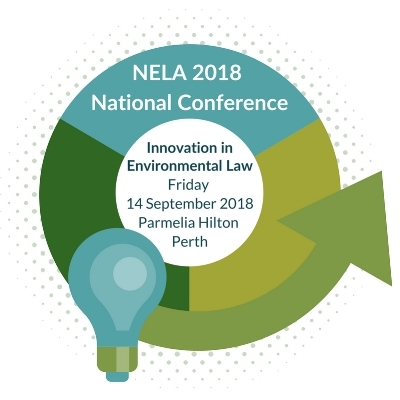 The National Environmental Law Association's 2018 National Conference will be held at the Parmelia Hilton Hotel in Perth on Friday 14 September 2018. The conference will explore the topic of environmental innovation and the role to be played by the legal system in facilitating change. The conference will include presentations on where Australia sits in regard to global innovative trends, how emerging technology is being applied in practice and discussions on how the legislative framework supports or prohibits innovation. Glen McLeod, Principal, will be presenting on Innovation and the Regulation of Greenhouse Gas Emissions in Western Australia as part of a session focusing on Challenges and Opportunities in environmental law. Jess Hamdorf, Lawyer, will be chairing a session on Innovation in Practice with representatives from BHP Nickel West, InfraNomics, Martin Biopower and Power Ledger. Connor Fisher, Lawyer, will be chairing a panel session titled Future Focus with representatives from various sectors interested in the future of environmental law.